“If you want to write stories now, don’t put your teachers in them. For, I have had pretty bad experiences myself which goes back to my school days around the time of Independence when I was 10 years old. My first little story, which had some disparaging remarks about the principal, was confiscated and torn to pieces, never seeing the light of the day. 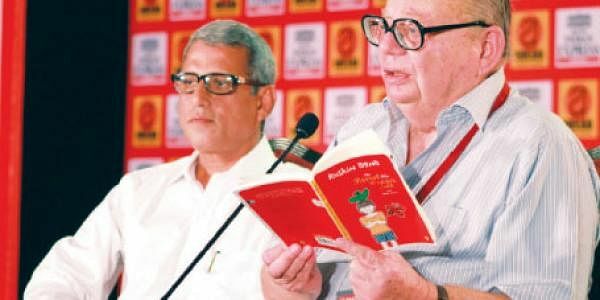 So play safe,” advised India’s most lovable writer Ruskin Bond, as the hall burst into laughter. The second day of the first Odisha Literary Festival 2012 was set in motion by the celebrated writer, who in his own inimitable style of simplicity laced with wit and humour, held the over 500 children in a State of absolute attention doling out pearls of wisdom on life, writing and literature. And, he did read out stories and poems to the young ones in between. For the children, the hour-long session would be cherished forever as indelible memories of meeting the icon, that they have adored, up, close and personal. Responding to a young one’s query on what really inspired him to write, Bond said he found inspiration in everything. Every one has a story to tell, everything has a story to it. Then came another question, What is your favourite book? “When you write a book or story, at that particular moment, it is your favourite. Later on you may not like it, though. But, I think the stories written in the early sixties, when I was in my 20’s and during the period when I struggled the most, can be classified as that,” came the response. Bond read out the short story “We recapture the Ghost’ from his book ‘The Parrot who wouldn’t speak and other stories’ to the children along with short poems like ‘If mice could draw’, ‘A plea for bowlers’, ‘This land is mine’ and ‘Dare to dream’, etc. He also recited “I danced the hip-hop in the rain” from his recently published ‘Hip-Hop Nature Boy and other poems’ and also revealed the inspiration for the poem lied in Bhubaneswar. “Bhubaneswar has become my favourite place now. More and more of my own stories and books will be set in Odisha. I have already written one story set in Gopalpur,” the writer, who has penned more than 120 books in the past 60 years, said. The session moderated by TNIE Resident Editor Srimoy Kar also saw release of “Sei Sabu Pila Dina,” a translation of Bond’s autobiography ‘Scenes from a writer’s life” by writer and editor of Literary magazine ‘Katha’ Gourahari Das. Bond also released the latest edition Kloud9’, a magazine for schoolchildren of which he is the chief editor.